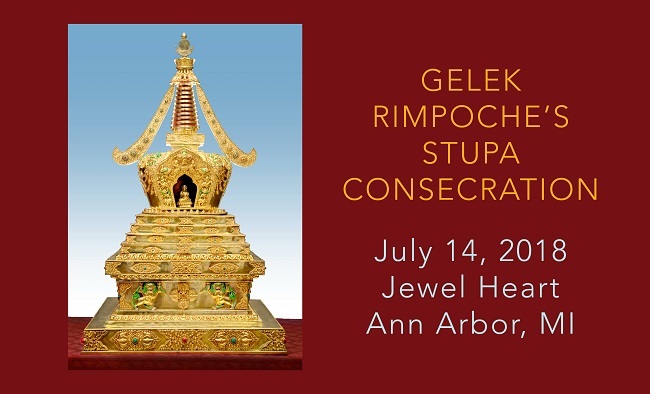 Jewel Heart Ann Arbor hosted the Stupa Consecration Ceremony for Gelek Rimpoche’s relics on July 14, 2018. The tradition of building stupas is a very old Asian custom that is similar to the pyramids, which house tombs that contain the remains of the old king and precious items for his use in the afterlife. Even today, different cultures build monuments to memorialize a great person or a great historical event. Similarly in the Buddhist tradition, a stupa houses the relics of a great being such as the Buddha or, in the Tibetan tradition, great lamas. When Buddha Shakyamuni was about to pass away, his assistant, Ananda, asked him how to handle his relics. Since Buddha Shakyamuni was originally born a prince he replied, “Do what we do for a king.” When he passed away, many of the kings wanted some relics. So the relics were divided into eight groups and given to each king, who then built a stupa for their relics. These eight stupas of Buddha Shakyamuni are known as the “Stupa of Nirvana” (nyang de in Tibetan, which means ‘leaving.’). ‘Leaving’ refers to both the passing away of the individual from this life but also leaving samsara for nirvana. These are the bell-shaped stupas that one sees in places like Indonesia, Thailand, and Nepal. In Tibet, the stupa tradition continued for the great lamas. In the Potala Palace, the former residence and government building of the Dalai Lama, there are stupas for each of the Dalai Lama’s incarnations. Ganden Monastery also has a stupa for Jamgon Lama Tsongkhapa. When a stupa is consecrated, the relics are first blessed and then placed inside. The wisdom deity is then generated. The main concept is to remember the qualities of Buddha and the guru and to build it very solidly to keep the memory of the Guru for a long time. The qualities of an enlightened being are divided into three aspects: body, speech (i.e., teachings), and mind (or heart). The qualities of the body are represented through statues, speech through scriptures, and mind through the stupa. The mind (or heart) of an enlightened being is not physical or tangible. It is the consciousness from the previous life that continues. The stupa honoring Gelek Rimpoche is known as an enlightenment stupa. The design of it represents the 37 Harmonies of Enlightenment. These 37 are divided into seven categories: the four mindfulnesses, the four perfect abandonings, the four magic feats, the five powers, the five forces (what Demo Rinpoche calls ‘superpowers’), the seven branches of enlightenment, and the eight-fold path. The stupa, from bottom to top, is designed to represent the 37 Harmonies. The four levels, or steps, represent the four mindfulnesses. The flowers represent the five superpowers. The vase (what looks like a cave with the statue inside) represents the seven branches of enlightenment. The square on top of the vase represents the eight-fold path. Above that are thirteen stacked rings that represent the ten forces and three special mindfulnesses of Buddha. And at the very top is an umbrella that represents the great Buddha compassion (in Sanskrit, karuna, which is the mind that protects other people). The umbrella symbolizes protection. We show our respect and humility to the Guru and representation of enlightenment by making clockwise circumambulations. That represents that we want to gain the same qualities, to keep close to the qualities, to practice and achieve them. Please feel free to leave your thoughts and memories of Rimpoche in the "Leave a Message" area below. Dear Friends, thank you for all you have done for Jewel Heart as it continues to present, preserve and distribute the authentic Tibetan Buddhist teachings of Gelek Rimpoche. Rimpoche brought sanity, love, intelligence and meaning to my life. I am forever grateful for my Guru, the Dharma he brought to us and our Sangha he gifted us. This is amazing and I am thankful for this time. I am very thankful for knowing Gelek Rimpoche since 1999, for all the teachings at Jewel Heart New York, Retreats at the Garrison Institute since 2003, and for all the help and love he offered me, giving of his wisdom, compassion, and for the “intelligent faith” I generated in my Buddhist practice and I continue to experience his guidance and helping hands in my life every day. Thanks Jewel Heart Sangha! I never met Gelek Rimpoche personally, but I studied a comentary on the Guru Yoga given by him. I am very grateful and I very much appreciate his work and all of the members of Jewel Heart! Please continue spreading the love! We are the luckiest bees! Meeting and slowly becoming close with Rinpoche was like entering a protective bubble. Not a bubble in the sense of something false or destined to pop but a safe ecosystem, the protection of being in the presence someone with the most uncommon form of common sense, someone who really knew the difference between right and wrong. The bubble was big. Generous enough to stretch from Lhasa to Delhi, from Malaysia to Manhattan. It had room for the Dutch, the rich, the hungry, the angry, the grasping, and the lost. Diaphanous, gossamer thin, yet blast-proof, being inside Rinpoche’s mandala was literally heaven on earth. It was glimpsing a taste of nirvana right here in the choiceless cycle of contaminated rebirth we call samsara. It was a grounded and solid way of being—as light as a hologram and equally vivid. I believe the word nirvana in Sanskrit is comprised of two words. Nir means to cease and vana means spin. So nirvana means to stop spinning. Rinpoche had that quality of dynamic stillness. I don’t like to think of myself as superstitious so I hesitate to say this but I feel like once I began attending teachings and retreats and really entered into jewel heart, my life started getting radically better. Of course I still have all the usual trials and tribulations of life. But once I had Rinpoche, I felt like I was encased in a realm of safety and prosperity—like one of white Tara protection realms. I remember once congratulating John Madison on something he did and he said something like, oh it’s all the blessings of the Lama. At the time I didn’t really understand. But after a few years I gradually began to feel that my life was being carried aloft on the jet stream of Rinpoche’s karma. Like the kids on skateboards I used to see in Brooklyn holding on to the back of city buses, I was being carried along by the velocity of his goodness. There were mundane things and other signs. Samsara didn’t evaporate. I’m still schlepping through it. But inside Rinpoche’s mandala I felt what our friend Dr. King would explain as a steady decrease in cortisol levels and a commensurate increase in dopamine. The physiology and neuroscience behind meditation is known but i’m not taking about self induced visualization, I’m talking about a relationship, the specific experience of guru yoga. Time and again, as I downloaded some melodrama to him Rinpoche would reach out and pinch my chin and gently shake my face side to side, I felt both loved and tickled. I saw the pettiness of my drama but not demeaned by having that pointed out. Instead I felt elevated by his belief in what I could become. Most of all, I felt safe and protected, as I know we all did. In reflecting on what precisely the mechanism was behind this extraordinary quality he embodied, I think it was the combination of profound sensitivity and inner calm he exuded. He was Mountain-like and yet eminently pliable. He had an uncommon balance of gentleness and precision—or as Kathleen ivanoff so beautifully put it, an elegant levity. Tolstoy said every unhappy family is unhappy in its own way. Rinpoche turned that quote inside out. He saw each of our own ways of being unhappy and he made us feel capable of solving the problems we create for ourselves, by ourselves. He made each of us feel protected in a different way, he had a relationship that was unique to each of us. Like the Buddha who could speak to an audience and everyone could understand in their own language without UN translators, Rinpoche could speak to each of us, whether in a group or one on one, and we each received a customized message. That’s an extraordinary quality. There was also a fearlessness in him, when dealing with the mentally ill or the occasional street person who would wander into a teaching. He just never panicked. He didn’t have a panic button. He had a wisdom button and it was always pressed. Rinpoche was more than just a teacher, friend or spiritual guide. He was an effortless catalyst for inner alchemy at the highest level. He made our lives more meaningful by giving us the skill to discover our own mettle. And now, as we digest the shape of and taste of his absence, it is up to each of us to protect each other. That is one way of defining sangha. Like the beads of the mala, we also represent the continuity of the lineage. Meaning, the way wisdom is transmitted from one mind to another, down the line. And here we are. Recipients and caretakers charged with an incredible inheritance.